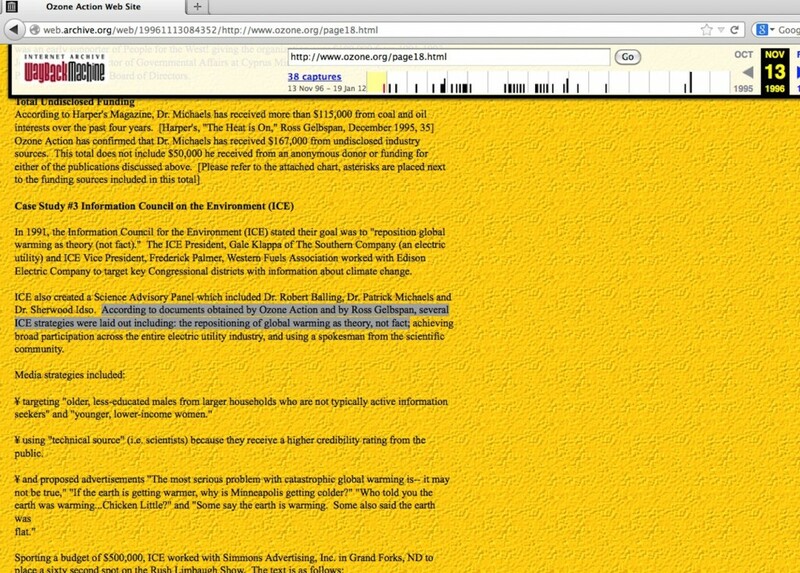 My 11/18 blog dealt with Ross Gelbspan’s claim that ‘a top CNN editor’ was scolded by a supposedly powerful industry group for attempting to connect weather events to global warming, where the threat was made that advertising would be pulled if CNN’s reporting did not meet the approval of that group. His claim appears to fall far short of being infallible, and from that, maybe it is not out-of-bounds to speculate on just who the CNN person might be. Since Gelbspan was a newspaper editor himself (a job traditionally encompassing top level decision-making on inclusions/exclusions of specific print article content), we might wonder if he confuses what video editors do with the duties of producers. I’m no authority in any of these fields, but I get the impression that TV editors oversee the assembly of video pieces, ensuring a seamless easy-to-understand presentation, while producers, especially the top ones, oversee what goes into the information content of the video. 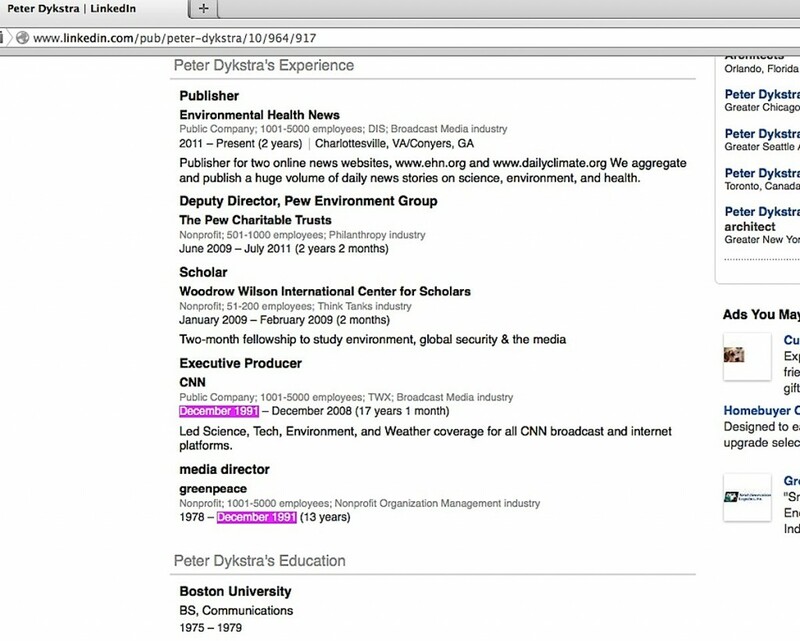 I mention this because of a particular name I saw in two of the CNN pieces I linked to in my prior blog, Peter Dykstra. He was specifically mentioned at the bottom of one as a contributor alongside Natalie Pawelski and was the author of another …. where he is listed as an Executive Producer (note: Pawelski arguably was not a ‘top’ producer at CNN at that time, but as seen in this photo, she does have her ties to Gelbspan). 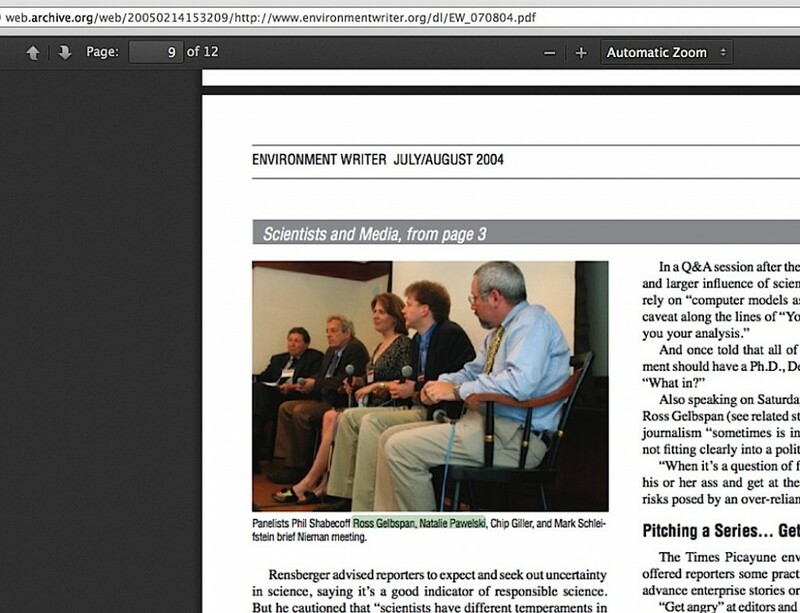 Back in 2009, when I first began writing about the smear of skeptics at American Thinker, I mentioned a quote from Dykstra at the top of a list of several people who spoke of the notion of reporters giving unfair balance to skeptic climate scientists. I had no idea at the time what other relevance he had in this whole matter, but as I dug deeper into all of this, his last name is hard to miss. The connections are fascinating, and do not seem to be coincidental. 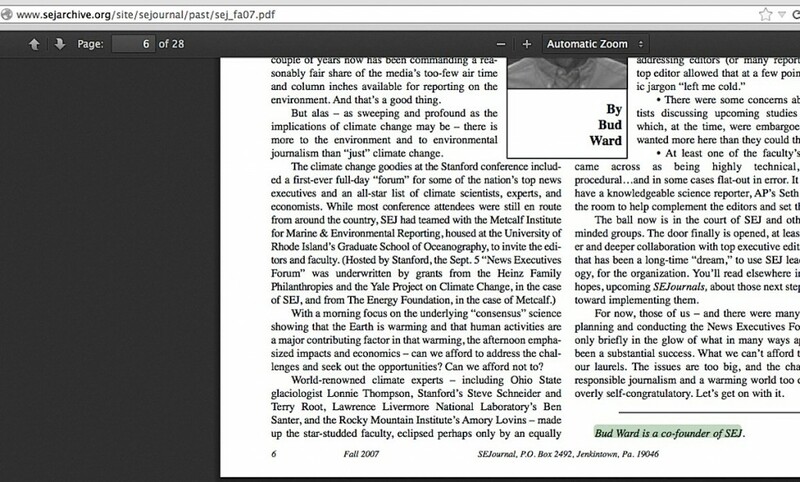 The bit in my A.T. piece was how Robert McClure (a Society of Environmental Journalists board member who had previously offered me the unsupported idea that Gelbspan’s work was also documented by others) quoted Dykstra’s concern over skeptic climate scientist Patrick Michaels getting too much ‘false’ media balance. 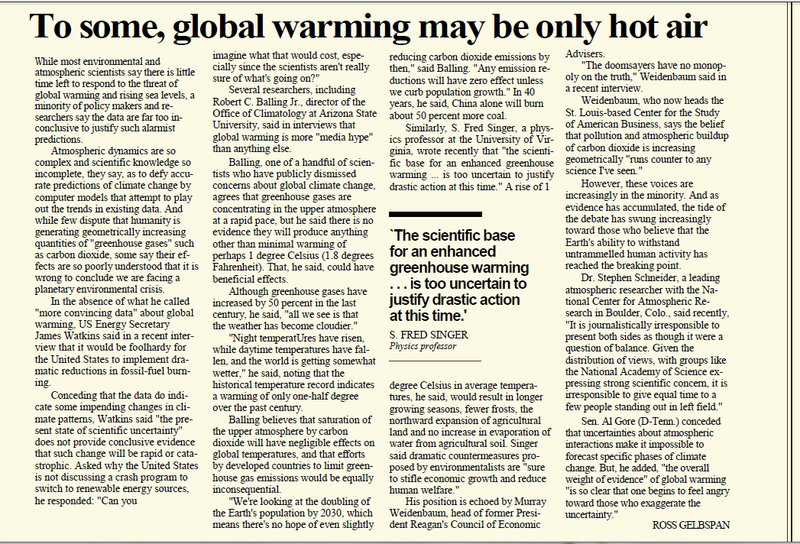 That’s one of Gelbspan’s oft-repeated assertions which goes back to one of his last Boston Globe articles, where he quoted the late IPCC scientist Stephen Schneider infamously saying “It is journalistically irresponsible to present both sides as though it were a question of balance“. The interlacing of that assertion about ‘media balance’ and Stephen Schneider, Gelbspan, and key people at the SEJ will need an entirely separate future blog piece here. 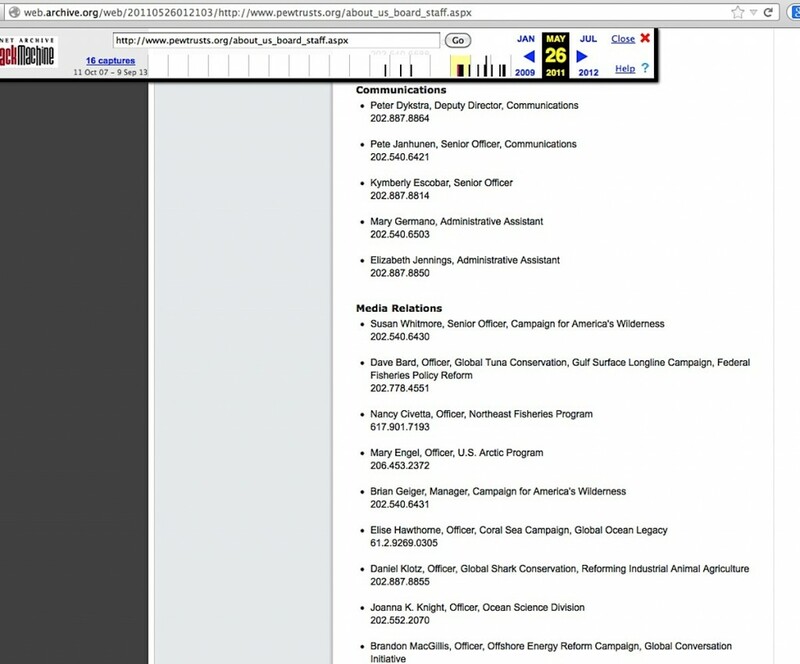 About 6 months after Dykstra was laid off from CNN, he ended up as the Deputy Director of the Pew Charitable Trusts’ Environment Group, where two key people from the old Ozone Action group, Brandon MacGillis and Kymberly Escobar, happened to work, as seen in this screencapture of Pew’s Environment Group flyout menu, 1st, 3rd & last name there (online version here) Lest anyone forget, Ozone Action was the place that apparently helped Ross Gelbpsan’s infamous “reposition global warming” accusation phrase get media traction. 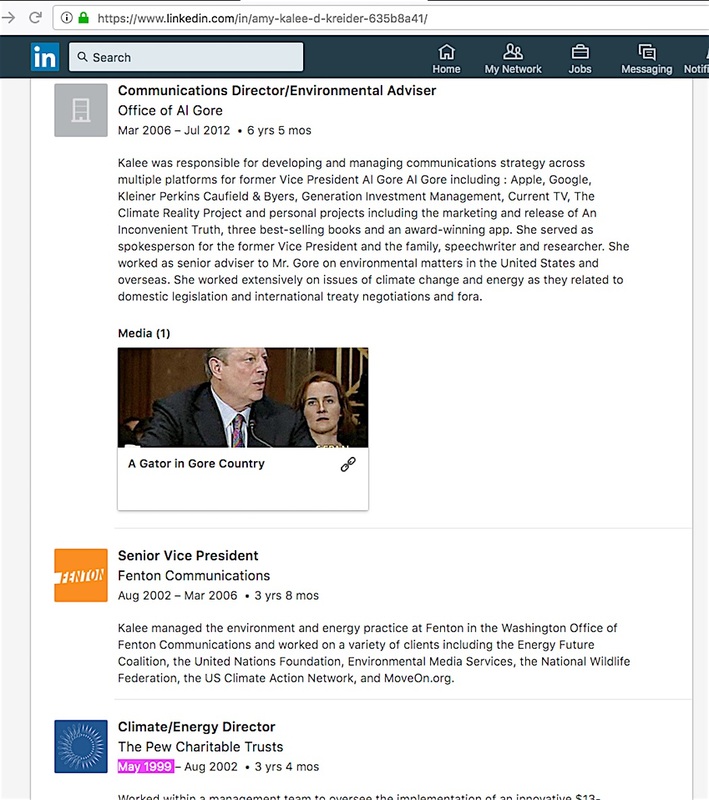 And for one more entertaining connection, the National Environmental Trust (NET) merged with the Pew Environment Group in 2007, and guess who was NET’s Climate/Energy Campaign Director from 1999 to 2002? 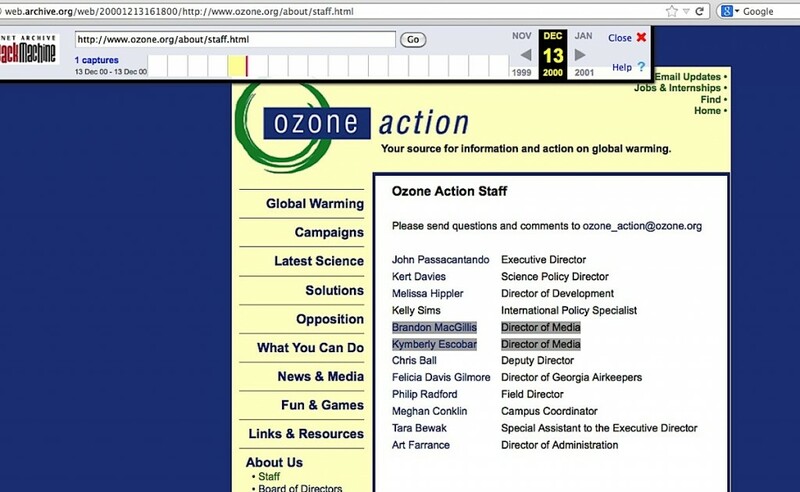 Kalee Kreider, another alumnus of Ozone Action, more famously known as Al Gore’s long-time spokesperson. For those who’d accuse me of putting out a ‘ships-passing-in-the-night-years-apart’ thing about Dykstra & Kreider, guess again. The two were conversing with each other on Twitter just days ago. 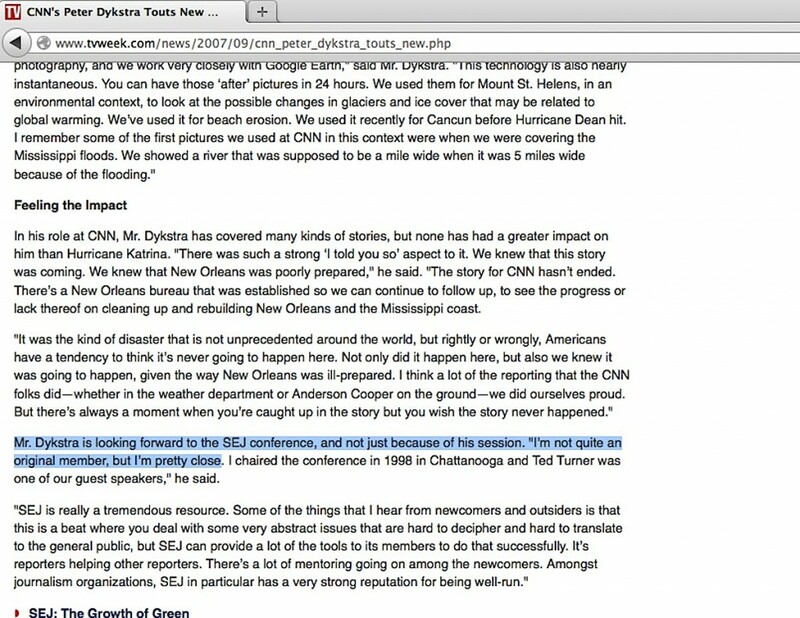 Certainly also worthy of a closer look is how Dykstra changed jobs late in 1991 from being Greenpeace’s media director straight to working for CNN. This apparently coincides with the start of his membership with the SEJ. Some of the earliest PDF files for the SEJ newsletter, where new members are named in each issue, don’t work, but Dykstra does at least confirm his early-on membership himself (full context here). Not seen on his LinkedIn resumé, but mentioned at another bio was a detail arguably qualifying him to be a journalist, his column writing at The Progressive Magazine. Bud Ward, by the way, is among Ross Gelbspan’s biggest fans. I will have to devote at least one future blog piece to this problem, if not more. 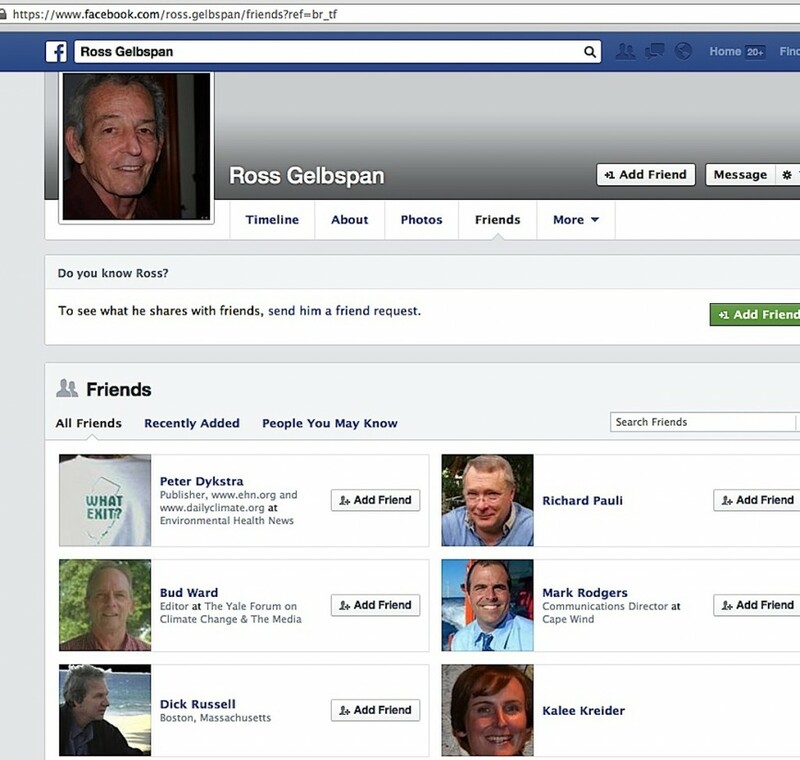 Not surprising Ward is among Gelbspan’s Facebook Friends. 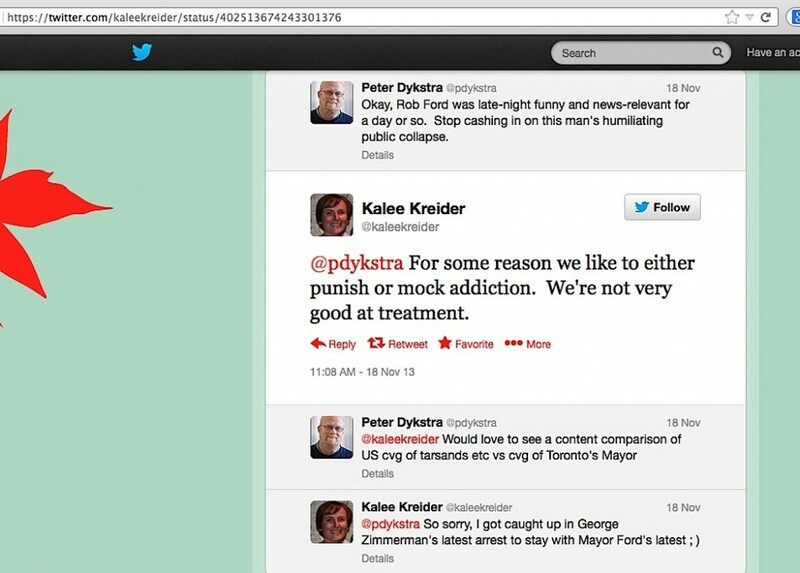 So is Dykstra and Kreider. Is Dykstra the “editor” Gelbspan so famously cites as the person who was intimidated by an industry group over CNN’s manner of reporting global warming? It’s one question among a growing pile that needs to be asked, since Gelbspan repeatedly uses the event to insinuate that sinister industry forces attempted to silence the truth about the issue. If the event did not happens the way he describes it, and Dykstra turns out to have been a highly biased gatekeeper to the release of news about the skeptic science side of the issue, we have a big problem. This entry was posted in Society of Environmental Journalists, Three degrees of Separation or Less and tagged Brandon MacGillis, Bud Ward, CNN, Kalee Kreider, Kymberly Escobar, Peter Dykstra by Russell Cook. Bookmark the permalink.